The Henty family were the first Europeans to settle within the Port Phillip district (now country Victoria). Edward Henty and his brother Stephen arrived at Portland Bay in 1834. 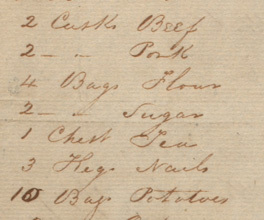 Among the inventory of their ship the Thistle were bullocks, cows and pigs, along with baskets of tobacco, flour and two ‘casks’ of beef and the same of pork. A month later, the third Henty brother, Francis, arrived with Victoria’s first Merino sheep. In 1832 the Henty brothers had travelled from England with their father, Thomas Henty, a successful sheep breeder. They had been given land at Swan River in Western Australia but after two failed summers decided the land was too poor to farm. They relocated to Van Diemen’s Land where they hoped to secure a freehold. They were too late. When they arrived there was no unoccupied productive land available. Thomas Henty’s sons were impatient. As they could not farm in Van Diemen’s Land, they turned their attention to ‘the opposite coast’, the virtually unknown Port Phillip district of New South Wales. Their father petitioned the British Government in London three times to settle in the Port Phillip district but was rejected each time. The British authorities forbade the settling of land that was not easily accessible from Sydney. The Hentys then decided to settle the Port Phillip district illegally. They did so in the belief that they would eventually be granted the land. Undoubtedly capable and energetic in youth, but excitable, and later socially ambitious and somewhat vain, Edward, Victoria's first settler, is popularly regarded as the chief actor in the early history of Portland Bay; but the backbone of the growing town and the first to set up stations inland was undoubtedly Stephen George Henty. Bassett, M 1966 'Henty, Thomas (1775 - 1839)', Australian Dictionary of Biography, Volume 1, Melbourne University Press, 1966, pp 531-534. In the early years of settlement, the Hentys established a small farm and began whaling at Portland Bay. Their move inland came after they were found, to the surprise of both parties, by Major Thomas Mitchell’s expedition. Mitchell told the Hentys about the good farming land that was nearby and encouraged them to move their sheep northward to the fertile land surrounding the Wannon River. This was a successful move. By 1839 the Hentys possessed over 30,000 sheep and 500 head of cattle. In the 1840s when land and stock prices collapsed the Hentys faced financial ruin but recovered. The Henty run was known as Merino Downs and is still owned by the descendants from Victoria’s first European settlers. Anne Drysdale and Caroline Newcomb were remarkable women for their time as they were both landholders and pastoralists.